Posted on November 12, 2018 November 9, 2018 , in Above Ground Pools. One thing that makes rules and regulations surrounding pools is that they are always different depending on where you live and what the local government has to say about the matter. Get in touch with your local swimming pool dealerships as they will have plenty of experience when it comes to the type of regulations that affect swimming pool owners. Also, make sure to check with the local authorities as well to ensure that you remain within the local bylaws. The need for a fence surrounding an above ground pool is usually dependent on how high the walls of the pool are in relation to the ground. In certain municipalities, above ground pools with walls, more than 52 inches off the ground do not require the erection of a surrounding fence. In cases such as this, the walls of the pool act as a type of fence anyway. Conversely, if the walls of your above ground pool are lower than 52 inches, a fence must be erected to surround the entire pool. This will prevent young children and possibly animals from easily accessing the pool and ending up in a dangerous situation. Once again, check with your local swimming pool dealer and the municipal bylaws to find out the specific rules in your area. When it comes to in-ground pools, the likelihood of needing a fence is much higher. There may be exceptions for in-ground pools that have automatic pool covers, but you’ll need to check the local laws to see if your area makes this exception. Automatic pool covers are quite often built so that the pool is completely inaccessible when it’s closed. No one will be able to get into the pool without doing some serious damage to the cover. Pools that are partially in-ground may require that fencing is placed around the parts of the pool that are in the ground. 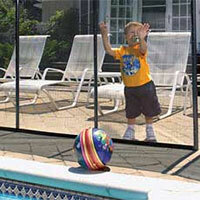 Some municipalities will require partial in-ground pools to be completely enclosed by a fence. Once again, it’s important to check your local bylaws to ensure your swimming pool is compliant. Now that you know about permits, to learn more about our above ground pools, download a buyer’s guide.